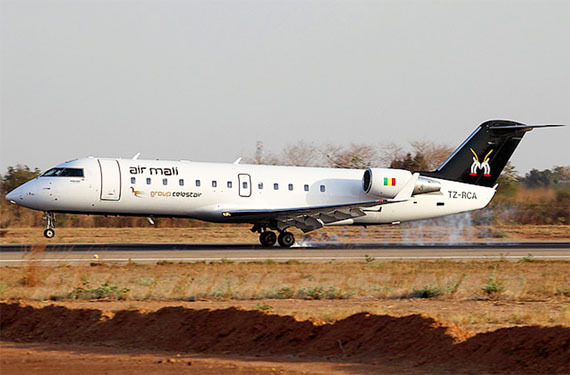 MALI: Air Mali tests the waters by operating its CRJ200 and MD87 on behalf of sister carrier, Air Burkina. As the political situation in Mali begins to settle down, so Celestair Group’s Malian subsidiary, Air Mali (I5), has taken its first steps towards resuming operations by dusting off its stored Bombardier CRJ200 (MSN 7392 | TZ-RCA) kept until recently in France. According to ch-aviation, the jet will not resume full operations for the Malian carrier just yet, but will instead join its sister, a McDonnell Douglas MD-87 (MSN 49832 | TZ-RMA), in operating for Celestair Group’s Burkinabe subsidiary, Air Burkina (2J). It is to be recalled that Air Mali suspended operations in late December just as Islamist fighters were closing in on the Malian capital Bamako. Since January 2012, the West African nation has been in turmoil following an uprising that saw the partition of the country into two regions: the more conservative Islamic partition of Azawad in the north and Mali itself in the south. However, a recent foreign intervention force lead by France has, to some extent, succeeded in returning “Azawad” to Bamako’s control.